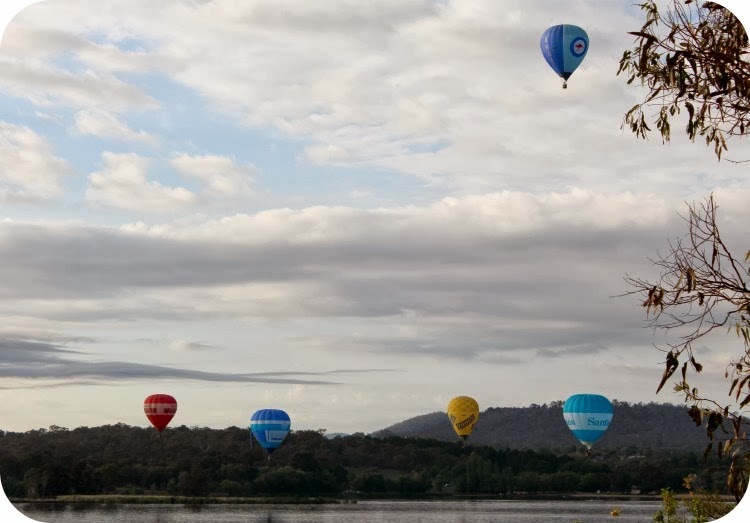 Girls Wear Blue Too: Canberra Hot Air Balloon Festival 2014. 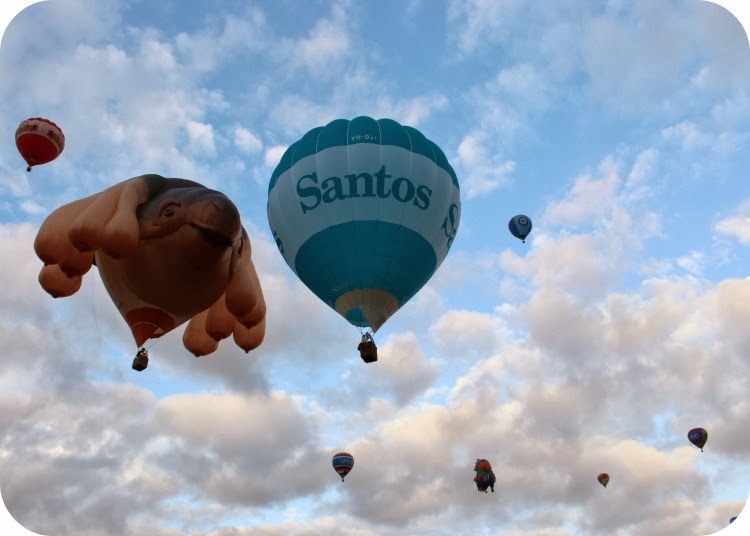 Canberra Hot Air Balloon Festival 2014. Saturday morning we headed off bright and early to see the hot air balloons being inflated and launched. 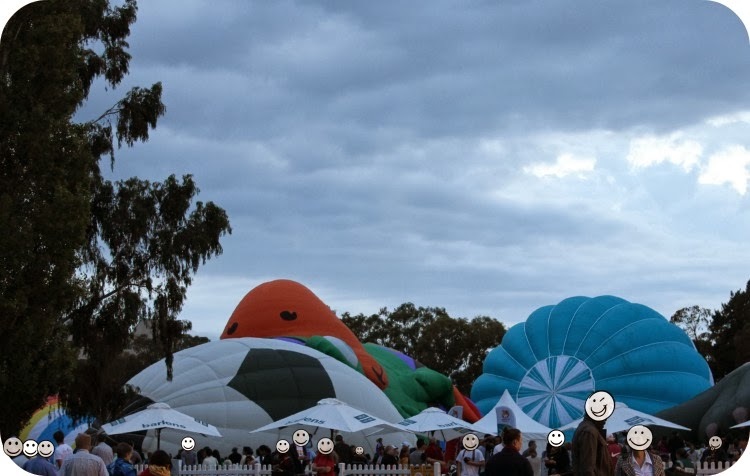 This is one of my favourite events in Canberra each year. It was overcast in the morning and still quite dark when we arrived. Attending on Saturday and arriving at around 6.30am made getting a parking spot much easier than I have encountered before. 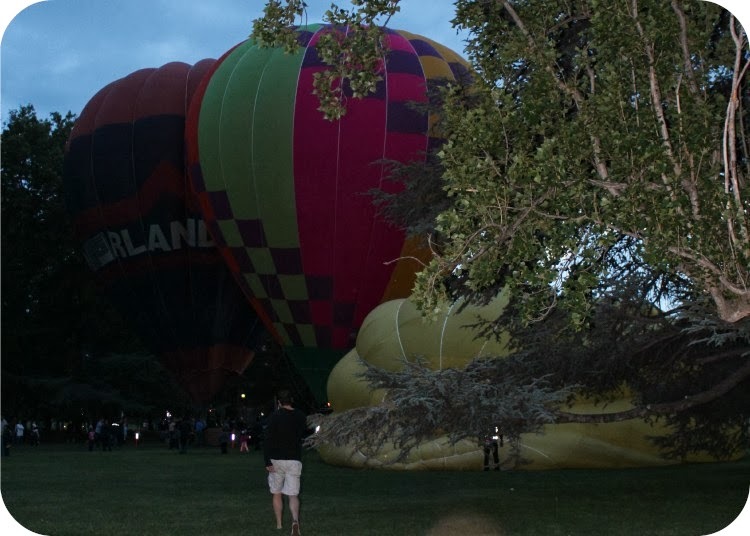 This was the first thing we saw as we entered onto the initial launching lawn, these balloons were first to take off. Once we passed through these guys and took our photos we headed to the second lawn where the kids were excited to see the pirate parrot and soccer ball while I was keen for my first in person glimpse of Sky Whale. The crowds were big and photographers a plenty were present. As it turned out this middle area was most densely populated as the best viewing point for all launches with another launch area just beyond this and a 4th section to the right of it. 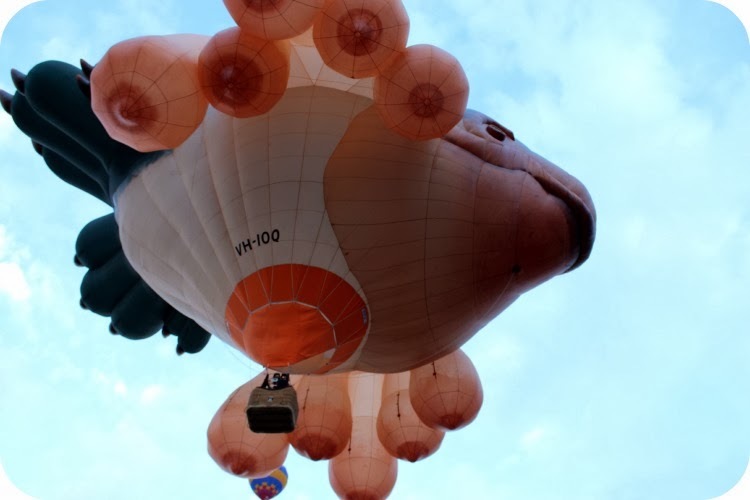 We were standing right beside Sky Whale as she was inflated and so in a good place for some photos as she took off. I'm quite intrigued by her tail which looks like the clawed foot of some kind of creature. Once all of the Balloons were in the air we headed back to the car. Ready to come home and have some breakfast, we saw the balloons coming in low so I took a bit of a spontaneous detour to Black Mountain Peninsula and we were rewarded with some beautiful views of the Balloons coming in low over the water, I made a spontaneous stop on the side of a road last year to take some pics of the landing field. 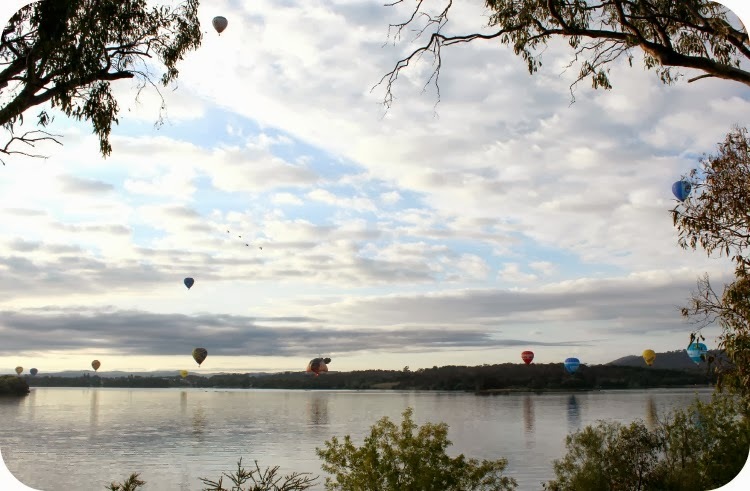 For some lovely lake view shots of the balloons please pop over to see the Kayak Cameraman who took stunning photographs of the balloons and has a blog filled with glorious images taken from his kayak. 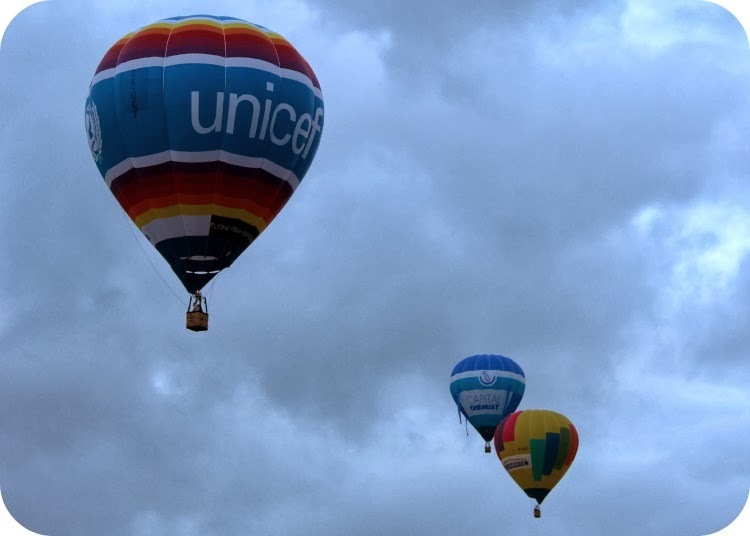 if you are interested you can see my Hot air Balloon posts from years prior on this link - right back to when my boy was a toddler. Lovely photos, Tammy. What a great event! I love the photos taken from the kayak as well. Simply beautiful! This is so beautiful! Loved your instagram shots as well!